NOTE: Before purchasing, check with your instructor to ensure you select the correct ISBN. Several versions of Mastering™ Chemistry exist for each title, and registrations are not transferable. To register for and use Mastering Chemistry, you may also need a Course ID, which your instructor will provide. If purchasing or renting from companies other than Pearson, the access codes for Mastering Chemistry may not be included, may be incorrect, or may be previously redeemed. Check with the seller before completing your purchase. 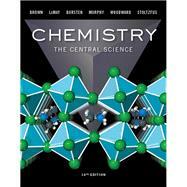 This package includes Mastering Chemistry . Personalize learning with Mastering Chemistry. Mastering™ Chemistry is the leading online homework, tutorial, and assessment system, designed to improve results by engaging students with vetted content. The enhanced eText 2.0 and Mastering Chemistry work with the book to provide seamless and tightly integrated videos and other rich media and assessment throughout the course. Instructors can assign interactive media before class to engage students and ensure they arrive ready to learn. Students further master concepts through book-specific Mastering Chemistry assignments, which provide hints and answer-specific feedback that build problem-solving skills. With Learning Catalytics™ instructors can expand on key concepts and encourage student engagement during lecture through questions answered individually or in pairs and groups. Mastering Chemistry now provides students with the new General Chemistry Primer for remediation of chemistry and math skills needed in the general chemistry course.